Increasingly often we find ourselves confronted with unintended and sometimes drastic changes such as growing climatic variability, loss of biodiversity and soil fertility, or loss of jobs through globalisation. Resilient social-ecological systems have the capacity to cushion these changes and adapt to them. In vulnerable systems, even small fluctuations can have catastrophic impacts and threaten livelihoods. The concept of resilience is based on the understanding that social and ecological systems interact, depend on each other and are dynamic. It deals with the following questions: a) How can these systems cope with shock or gradual change and recover to a desirable state, b) to what extent are they capable of self-organisation, and c) do they have a capacity for learning and adaptation? The resilience approach poses new, unusual and therefore demanding challenges to the management of socio-economic systems as well as to the society as a whole. Among other things this requires the creation of institutional structures that correspond to both ecological and social processes, while concerning and interlinking various temporal and spatial levels. For a long time resilience received little attention from outside the scientific community. In recent years, however, it has been realised that this concept can make an important contribution on the way to sustainable development. The most recent issue of "UPDATE", the newsletter of the International Human Dimension Programme on Global Environmental Change (IHDP), features a theoretical introduction to the concept, followed by concrete examples. Among others, an article by M. Bollig describes how two herder societies in Africa have developed different capacities to adapt to change and continue developing, based on the extent of their respective economic diversity and on their different social structures and ecological conditions. If the theoretical concept is to be applied in a way that it is relevant for development, it is necessary to deal with the question of how the resilience of a social-ecological system can be augmented in order to increase its capacity to adapt to change or perhaps even use change in a positive way for further development towards sustainability. The international Task Force on Livelihoods and Climate Change presents successful projects in its Information Papers. 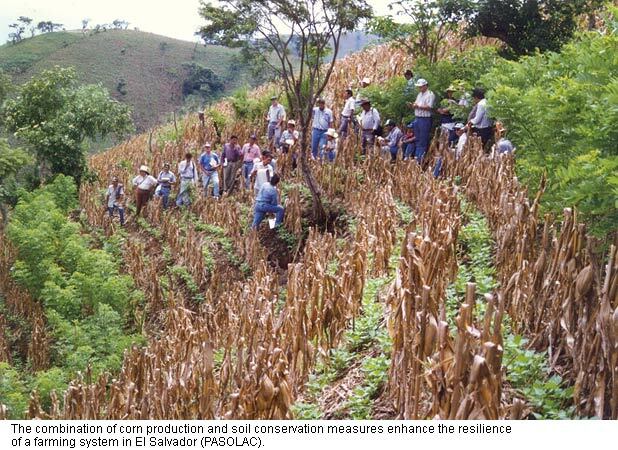 The PASOLAC programme (Programa para la Agricultura Sostenible en las Laderas de América Central) was able to enhance the capacity of societies to adapt to climatic change by improving, among others, water management, farming systems and social organisation. Unfortunately, the limitations of the resilience concept are often not sufficiently recognised. As an approach it is not far-reaching enough to provide basic solutions to the current problems of global change. The questions of what is causing the problems and how they can be mitigated need to be dealt with also at other levels. > Increasing the Resilience of Tropical Hillside Communities through Forest Landscape Restoration, Livelihoods and Climate Change, Information Paper No. 2, IUCN, iisd, SEI, Intercooperation, 2003, 5 p.
> Resilience, Update of the International Human Dimension Programme on Global Environmental Change IHDP 02/2003, 19 p.
> Navigating Social — Ecological Systems: Building Resilience for Complexity and Change. F. Berkes, J. Colding. C. Folke, Cambridge University Press, 2003, 393 p.
On 11 July 2003, the member nations of the African Union adopted the revised ”African Convention on the Conservation of Nature and Natural Resources”. The document is designed to ensure conservation and sustainable use of natural resources, as well as to harmonise related policies. It regulates a wide range of issues, among them the following: conservation and sustainable use of land, water and vegetation; genetic diversity; protection of endangered species; establishment of conservation areas; economic incentives; integration of ecological concerns into development projects; access to information and jurisdiction; intellectual property and indigenous knowledge; international cooperation; science and education. The member states commit themselves to both implement measures with an immediate impact and develop medium-term planning instruments such as strategies, land use plans and inventories. According to Achim Steiner, Director of the World Conservation Union (IUCN), the adoption of the convention can be seen as an expression of growing commitment to environmental issues and sustainable development among African policy-makers. Implementation will show whether this assumption holds true. Its success will also depend on the support provided by developed countries. Economic growth is by far smaller in countries with a rich resource base than in resource-poor countries. This is particularly true for countries with great amounts of mineral resources such as oil and minerals. However, it also applies — if to a lesser extent — to countries with comparably vast areas of arable land. This is one of the main, perhaps surprising, observations stated in a recent discussion paper of IIED’s Environmental Economics Programme. The author explains this connection by arguing that countries that have to rely on fewer resources were forced to develop by diversifying and industrialising. In contrast, countries richly endowed with resources tend to develop ”exploitative” mechanisms, while diversification and the promotion of productive performance are often neglected. The combination of an economic policy that promotes diversification with a comprehensive resource policy and good governance on the national level is a prerequisite for sustainable development in these countries. Unfortunately, the study does not deal with the question of whether global political failure aggravates the situation in resource-based economies. So, for example, no link is established between the low growth rates in many developing countries, the low prices for their agricultural primary products on the world market, and competition from the industrialised, high-input agriculture of the North. Degraded and secondary forests (the latter have been cleared of at least 90% of their original cover) represent 60% of the total surface which is statistically classified as subtropical forest. According to the World Bank, these resources provide a living for 300 million people. The legislation of many tropical countries does not distinguish between primary and modified forests, in particular secondary forests. Yet, the International Tropical Timber Organization (ITTO), in collaboration with several institutions (CIFOR, FAO, IUCN, Intercooperation and WWF International), aimed to raise awareness of the potential of these generally underdeveloped forests, by addressing planners and public policy makers, development and extension agencies. To this end, it published guidelines on the restoration, management and rehabilitation of degraded and secondary tropical forests, and it organised regional workshops. The role of the guidelines and the workshops is to present the basic political, socio-economic, legal, institutional, ecological and silvicultural issues which must be considered in any future forest management strategies. Highly structured in form (8 objectives, 49 principles and 160 recommended initiatives), these guidelines are quite flexible and able to adapt to local situations, and they allow for the participation of all stakeholders. They present a realistic account of what could be achieved in rural areas. According to this new report by the World Bank, strengthening the land rights of poor and marginalised population groups and simplifying land ownership transfer procedures are pivotal elements on the way to successful poverty reduction. Well-regulated ownership conditions and clear land use regulations create incentives for investment and can thus initiate economic growth. 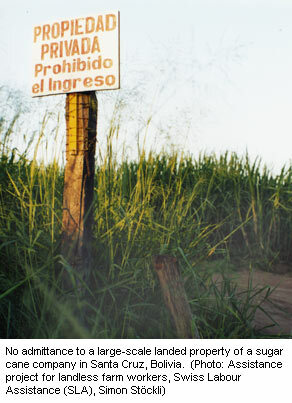 The land issue contains a great potential for conflict. Accordingly, rational policies and efficient legal frameworks are important to help secure stability within countries and regions. These insights are not new. However, in contrast to the World Bank’s last report on the land issue, dating from 1975, this new report documents a favourable development by making clear, undogmatic statements. One reason for this certainly lies in the concept according to which the report was created: its content is based on an online debate and, most importantly, on the results of four regional workshops in Hungary, Uganda, Mexico and Cambodia with representatives from civil society, policy-makers, and scientists. Their wealth of experience and theories are condensed into valuable ”lessons learnt”, which we hope to see integrated in national legislations and poverty reduction programmes. ”Fast-Wood Forestry” sheds a more balanced light than several polemic articles on fast-growing forest plantations (generally eucalyptus, pine or acacia). This book draws on the experience of countries, such as Brazil, Chile, Portugal and Indonesia, which have specialised in producing timber for paper pulp or wood-based panels. As the demand for fibres and paper continues to grow (particularly in the countries of the north and in urban areas), these plantations are not going to disappear overnight. This is why future projects must carry out a preliminary investigation into their social and environmental impact. These plantations can lower the ground water level and farming means that nutrients are extracted (though still less than agricultural farming); establishing them in humid areas and leaving any logging residue on site can limit the destruction. Certain misconceptions must be overcome to ensure more transparency: plantations do not prevent floods and they only rarely alleviate pressure on primary forests, and their contribution to carbon absorption is minimal. Nor do plantations necessarily create jobs. Nevertheless, the integration of local stakeholders in the decision making process can bring benefits to all concerned. On balance, it may be better to encourage consultation and appropriate planning of such plantations to meet heavy demand, rather than adopt extremist positions. Biological pest control is an important component of integrated pest management (IPM), which combines all economically, technically and ecologically applicable technologies to keep pests below the damage level, while minimising unwanted side effects of the applied measures. In a recently published book entitled ‚Biological Control in IPM Systems in Africa’, experts with years of experience in this domain have compiled a great amount of information on research and current technologies dealing with biological pest control in Africa. A particular focus is placed on insect pests affecting crops such as maniok, cowpea, potatoes, and trees. Each biological pest control measure is briefly compared to other possible measures of integrated pest management. In the last chapter, the authors explain why the listed plant protection measures are both economically and ecologically significant. Through this book, a comprehensive store of information on successful, viable, but also failed attempts at biological pest control in Africa becomes accessible to a broad public. The list of references is deliberately kept short, which makes it harder to follow some of the statements made. 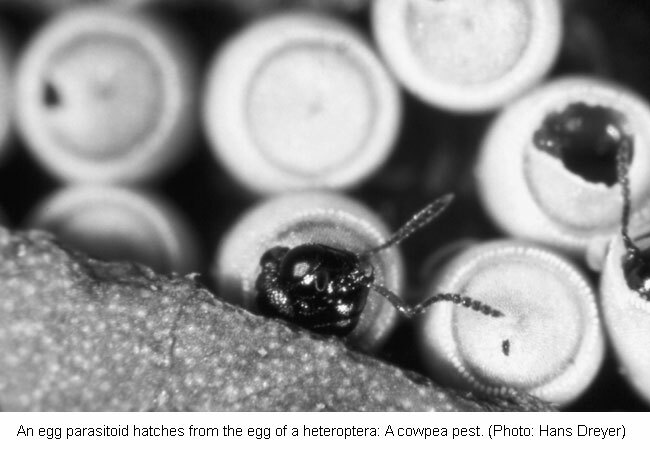 Source: Biological control in IPM systems in Africa, P. Neuenschwander, Ch. Borgemeister, J. Langewald, CABI Publishing, Wallingford, 2003. Environmental screening of all development activities is essential in order to achieve sustainable development. Therefore, the Department for International Development (DFID, United Kingdom) requires an environmental screening for all interventions with a financial volume of £ 1 million or more, and recommends it for all smaller interventions. The main objectives of an environmental screening are the identification and exploitation of opportunities in this field, the identification and management of risks, as well as the assurance to act in accordance with national and international environmental policies. This document is a step-by-step guide for development officers. It focuses on the environmental screening process during the design phase of interventions. General information on screening activities and more general appraisal processes is followed by instructions on how to create screening notes. The guide is completed by checklists to identify environmental opportunities and risks related to national development plans, economic growth, human development, governance, livelihoods, conflict and humanitarian assistance. Although mainly targeting DFID officers, this guide is a useful source of information and tools for all development practitioners. The isolated, but strategically important Pamir Mountains in Tajikistan have experienced considerable changes during the last decade. The political and economic transformation following the collapse of the Soviet Union has been accompanied by growing poverty, leading to dependence on external humanitarian support, social disparities and the decline of the public services. Nevertheless, the region’s natural resources (e.g. for hydro-power generation), coupled with its beauty and rich cultural and ethnic heritage, present a potential for development. In cooperation with regional agencies and local authorities, the Swiss Agency for Development and Cooperation (SDC) initiated a pilot project with the aim of preparing a strategic development vision that would help improve living conditions in the Tajik Pamirs. The other main objective of the project was to contribute to ongoing discussions on practical and participatory approaches that may lead to sustainable mountain development also in other regions of the world. The project involved the development of a knowledge system containing information on the current state, processes and trends of social and ecological systems. Data from surveys on various topics and information gained through participatory studies at the village level were incorporated in a geographic information system (GIS). On this basis, a strategic vision for the region was finally negotiated among all concerned groups during a multi-level stakeholder workshop. The knowledge system was handed over to the local authorities after an introductory training. On 20 June 2003 around one hundred scientists from all over the world founded the ”International Society of Organic Agriculture Research (ISOFAR)”. The aim of this organisation is to better integrate agro-ecological topics into agricultural research. Interdisciplinarity is accorded particular importance. The foundation of ISOFAR was initiated by the Swiss Research Institute of Organic Agriculture (FiBL) and the Institute for Organic Agriculture (IOL) of the University of Bonn. The Society is open to all scientists interested in agriculture, as well as to organisations dealing with organic agriculture. After paying a registration fee, members gain access to the following services (planified): e-mail newsletter, complete website, a database of job offers for permanent employment or sabbaticals, a list of members, and topic-related discussion forums. Under the title ”Getting to grips with nature” ”Beyond carbon — emerging markets for ecosystem services”, the conference organised by Forest Trends, partner of the Katoomba Group and Swiss Re, will bring together business representatives, NGOs, regulators and public opinion leaders to examine the benefits of markets for forest ecosystem services. Looking at three aspects of the market (regulatory framework, operational capacity, and risk evaluation), the main objective of the conference is to improve information exchange and understanding of this subject, so as to encourage new conservation and long-term development strategies. In our opinion, this conference will offer opportunities and challenges for all stakeholders, and it will be worthwhile to evaluate its results.